Drivers heading north to San Francisco on Interstate 280 will notice a peculiar home just east of the Eugene A. Doran Memorial Bridge. 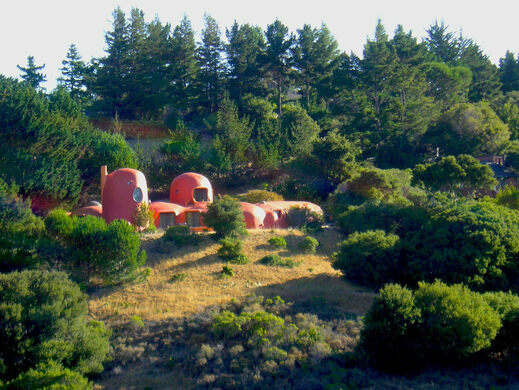 The house, playfully dubbed by Bay Area residents as The Flintstone House, is actually an experimental house built in 1976 with rooms in which every surface is rounded. Beneath its burnt orange (originally white) coat of paint is a slew of cement, rebar, plaster putty, wire mesh, and aeronautical balloons. This building technique, known as “monolithic dome construction,” was invented by the South brothers in Shelly, Idaho, in 1975. 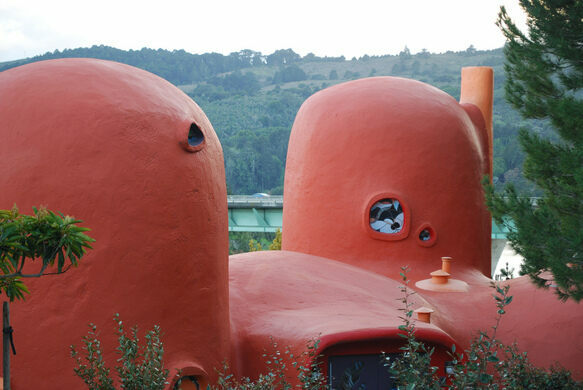 One year later, Bay Area architect William Nicholson built a series of domes using this method, including The Flintstone House in Hillsborough, California. The home, which is also referred to as the Dome House, Gumby House, Worm Casting House and, Bubble House, is a three-bedroom, two-bath house with a two-car garage and about 2,700 square feet of living space. The upstairs bedroom, located in the tallest dome, has a spiral staircase inspired by a sugar cone with a diameter that increases to equal that of the floor above. The master bathroom is also unique, with its scattering of large rocks in place of floor tiles. While The Flintstone House is marveled at by many passersby, it’s also loathed by many Hillsborough residents. In the mid-1980s, the home began to show serious wear as water runoff on the steep hillside caused it to sink and the walls began to develop deep cracks. Word spread of such problems and several neighbors pushed to have the home removed. However, to their dismay, a severe renovation and change in ownership brought the home back to life in 1987. 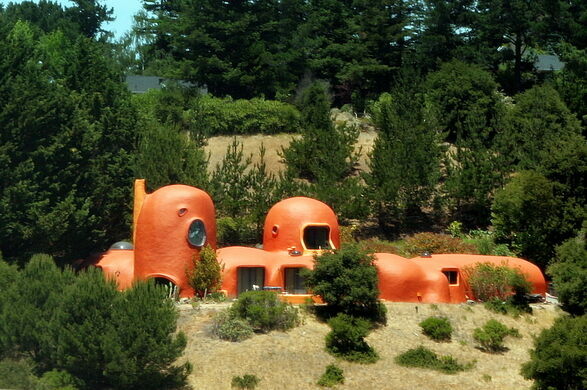 It took on its characteristic “Flintstone” look when it was painted completely orange in 2000. Today, The Flintstone House is as well known for its architecture as it is for its sporadic tenants, which has led to several urban legends surrounding the home’s ownership. It’s rumored that George Lucas once owned the house and that O.J. Simpson made a bid following his infamous 1995 trial. It’s also said that several famousSiliconn Valley investors have lived there as well. Regardless of ownership and neighborhood complaints, The Flintstone House remains standing. Overlooking the freeway and reservoir, it continues to serve as an unofficial California landmark and a lighthearted reminder of the Bay Area’s forward, yet sometimes quirky, thinking. Take I-280 north from San Jose/Palo Alto/Woodside. A few miles north of the intersection with State Highway 92, and just past the Bunker Hill Drive exit, look to your right as you cross the Doran Memorial Bridge.